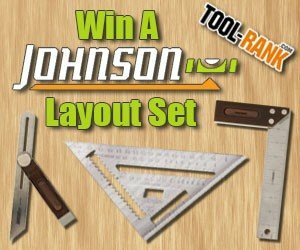 One grand prize winner will receive a new Johnson Level (1941-0700) Johnny Square, a (1940-0800) 8-inch Bamboo Try-Square, and a (1926-1000) 10-inch T-Bevel. Most rafter squares can be hard to read with their small numbers and markings, but the Johnny Square features deeper markings that make it a snap to read. It has a solid aluminum body that has machined edges for accuracy. Included are continuous notches for scribing from 3-1/2-inches to 5-1/2-inches. If that wasn't enough, it even has a built in bottle opener. Want nicer looking professional tools? That's why Johnson made their Bamboo series of T-Bevels and Try-Squares. They both feature real bamboo grips that give the tools a more elegant look and add strength and durability to the tool over regular wood. The 10-inch T-Bevel features an adjustable 10-inch stainless steel blade and stainless edging on the handle. Similarly, the 8-inch Try-Square features a stainless steel blade with etched 1/8-inch and 1/16-inch increments, and a riveted handle.